When it comes to the best Chicken Barbecue, the discriminating palate will always seek the famous recipe prepared by The Aristocrat. 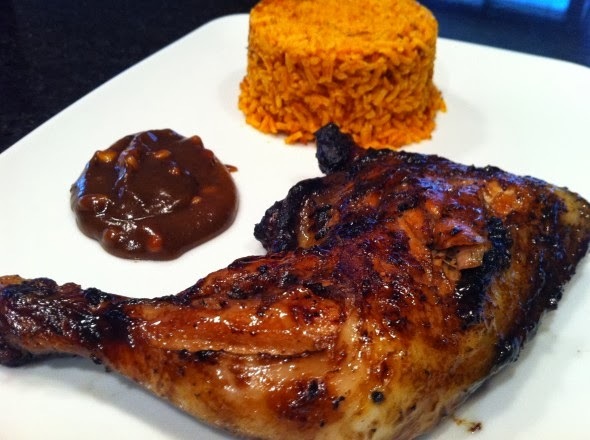 Through the years many establishments have attempted to challenge the clamor for The Aristocrat’s Chicken Barbecue but to this day no other restaurant can beat the unique taste that has defined the Filipino Culinary Culture. 1. Cut chicken into serving pieces. Cut breast in half lengthwise. Leave drumsticks attached to thighs. Place chicken pieces in a 13 x 9 inch baking dish. 2. Stir together soy sauce, lime juice, sugar, garlic and pepper. Add marinade;turn to coat completely. Cover with plastic wrap; marinate in refrigerator for 2 days. Bring to room temperature before grilling. 3. Prepare barbecue. Drain chicken pieces. Place skin-side down on grill over hot coals; cook, turning and basting with marinade every 10 minutes for 30 to 40 minutes, depending upon size of pieces, or until juices run clear when meat is pierced. Chicken will brown quickly because of the sugar in the marinade; do not burn. 4. For Peanut sauce, in a small saucepan, combine peanut butter, water, soy sauce and sugar. Boil for 4 minutes, stirring occasionally; sauce should thicken slightly but still be fluid. 5. For Java Rice, combine oil and annatto seeds in a small skillet. 6. Heat gently over low heat until oil turns a golden orange, about 5 minutes, swirling seeds in skillet several times. 7. Strain oil; discard seeds. Pour oil into a Dutch oven and heat. 8. Add the washed and drained rice and tomato sauce; and boil until liquid is absorbed, 5 to 10 minutes. 9. Reduce heat to very low; and cook without stirring for 30 minutes or until rice is tender. Fluff with a fork before serving. 10. Serve chicken with peanut sauce and java rice. Makes 4 servings. Note : You can also cook up to the part where the rice and tomato sauce is added, then transfer it to a rice steamer, and cook/steam rice as you usually do.